Queerly, however, the two state television broadcasters have decided to air two-hour commemorative programs titled appropriately as Nomiyena Sihinaya and Peo Legend to honour past legends. A legend who deserves a permanent place in these commemorative endeavors is Ranasinghe Arachchige Chandrasena Perera, musician 1940 – 1980. RAC hailed from Kandy. He was virtually a stranger to music industry. He hardly could evince any hereditary links to his musical prowess His sole guru was his father RA JierisPerera.RAC commenced his musical expedition as a “Carol Cart Singer.” He was the sole vocalist for a mobile Carol Cart created by his father which paraded traditionally in the streets of Dalada and beyond in Kandy. In Addition to his vocal talent RAC displayed innate skills in creating array of musical sounds and proved skillful in turning ordinary instruments like harmonium and violin into electrical instruments. Thus commenced practice of vocal music composition being backed by instrumental variety. 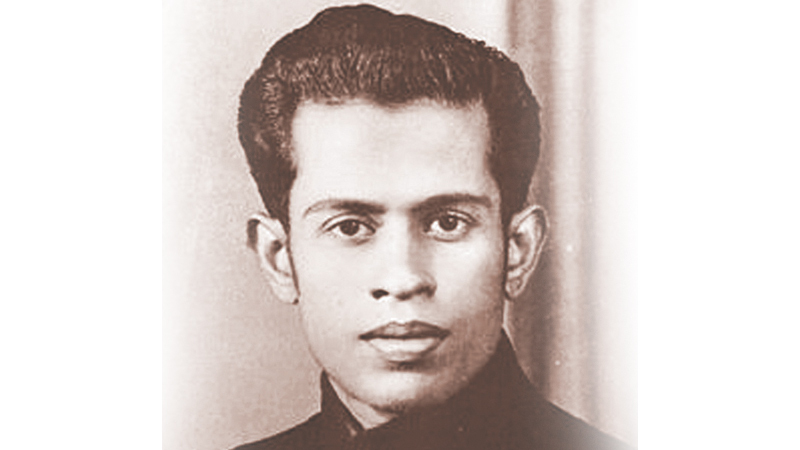 RAC commenced his musical career in late 1930’s in theatre music and later at the then Radio Ceylon in “Lama Pitiya”. In year 1943 RAC met at the Radio Ceylon audition a talented singer Sriyani Perera whom he selected as his life partner marrying her in the year 1946 .This proved to be fortuitous one ,as his spouse Sriyani and her three children were able sustain his vision after his demise. They were blessed with three children Thilangani. Lalith and Darshini. After his demise wife Sriyani sustained the RAC vision. Youngest daughter Darshini prolonged a career in music having graduated from the faculty of Aesthetic studies at the Kelaniya University. With elder sister Thilangani, Darshini has recorded a very popular duet for RAC’s music composition titled Malkiniththa wage Nangilassanai recorded at the Sarasaviya studios in Kelaniya. Darshini is continuing her father’s music school even today after her mother’s demise in year 2009. Reputed and loved for his musical composition, RAC has also been ardently honored for being the mentor for legendary singers like Dharmadasa Walpola, Victor Ratnayake .HR Jothipala, Nihal Nelson, Punsiri Soysa and a host of others and musicians like Premasiri Khemadasa. It is reliably learnt that it was RAC who initiated Victor Ratnayake to the musical world in 1962 at a show in Kandy Club. VR was the violinist for his orchestra at that time. Since then RAC had composed music for many of his popular hit songs including Mohen Mulawela RAC is said to have provided the opportunity for HR Jothipala to travel to South India initially by introducing him to BAW Jayamanne. RAC had made the music compositions for seven Sinhala films since the 1950’s.In those films there had been around 8 to 10 songs in each film. The audiences had flocked to hear the songs. The first song for his own music composition had been Jeevithe Preethi Sancharayaknovelowe for the film Kolamba Hadayo sung by Dharmadasa Walpola in year 1972 which was recorded at Ceylon studio. The other films with his musical scores were Iranganie, Mathabedaya, Daiva Vipakaya, Vedi Bima, Vanaliya and Miringuwa. The vocalists chosen were Rukmani Devi, Mohideen Beg, Dharmadasa Walpola, Shirley Blight, Eddie Jayamanne, Suriya Rani, GSB Rani, Latha Walpola, Sujatha Perera, Milton Perera and Mabel Blight. RAC has sung many songs composing his own music. The highlight was theme song for the drama Sanda Kinduri, the Dasabaladari Budu Raja Pera Kala with lyrics by Professor SL Kekulawela. This song was reproduced and sung by his grandson Harshadeva Ariyasinghe in 2013. He established his own musical school in year 1951 “Chandrasena Institute of Music”. This helped many aspiring musicians. He never discriminated anyone who was keen on learning.